Ask about a partner flush or full flush today! - Great prices and amazing genetics available to flush from B & B. At the 2014 ABGA National Show in Grand Island, Nebraska B & B Show Stock along with K & K Boer Goats received two papers we have been working on for many years!! We are very excited about receiving the Ennoblement Papers for both of these outstanding does! These two does have not only excited us in the show ring, but raising and producing some outstanding does and bucks! Their kids have won all over the country! KK47 Bianca -Owned by Jackie Ponder of Ohio! 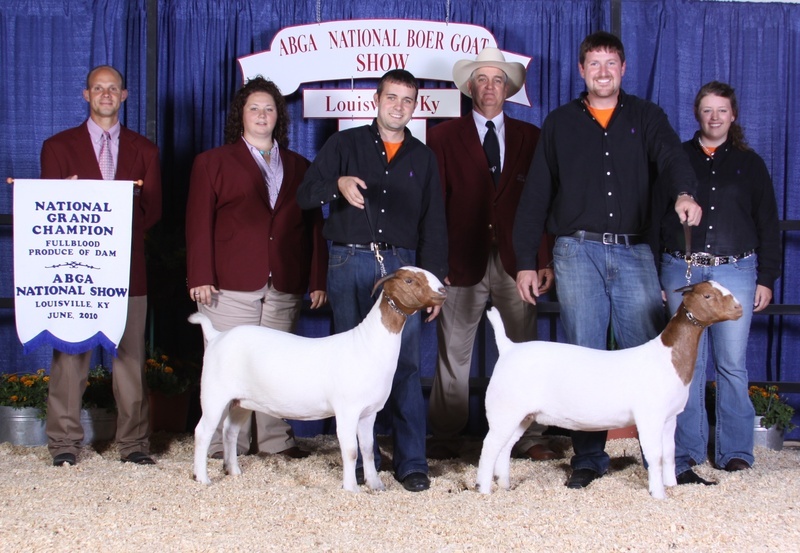 We started raising boer goats after having successful 4-H show careers with sheep, swine, and cattle. We currently have a small select herd of show fullblood does and percentage does. Our genetics consist of BB14 Mayhem Ennobled, Status Quo Ennobled, 2DOX CD's Salute Ennobled, WARDS Cat in the Hat Ennobled, BB14 Mayhem Ennobled (Son of Cat in The Hat & Grandson of Status Quo), Mojo Magic, Watcha Want Ennobled, and many others. B & B Show Stock & Green Goats have decided to include a select set of Market & Breeding Stock Producing Sheep Flock to our show operation. We will be offering market and breeding wethers, rams, and ewes starting again in 2017. We are already underway in the process for lambing, and adding in a new select set of topnotch yearling show ewes and pieces to our breeding program. We will be offering the following for market lambs: Dorset, Dorset Advantage/Speckles, Suffolk, Natural Colored, and Crossbred wethers/ewes. We will be offering the following for Breeding (Purebred Papered & Market Style) Ewes and Rams: Dorset, Dorset Advantage, Suffolk, and Crossbred wethers/ewes. All Purebred Dorset, DA, and Suffolk will be Slick Shorn purebred/papered ewes and rams. We will be opening the barn in 2017. If we do not have the breed or one you are looking for please remember we have ample places to choose from for your families needs. We have multiple sources to place ewes, rams, or wethers into your next show string or breeding program. Visit his page for more details! Won the 2010 National Grand Champion Produce of Dam. Call for details on flush and/or rights to flush. Blakely Judges county and state fairs! Call for bookings and details.